There are times when we don’t realize that through our actions we are leading and teaching others in meaningful ways. I think that the remarkable way we can influence others without knowing it is at the heart of teaching and learning. I recently had my internship advisor visit me at my school to check on the progress of my internship experience. As we walked the hallways of the school I was learning so much from her words and her actions, whether she realized it or not. Here are three pieces of wisdom she unknowingly left me with that I know will impact my future work. 1. Stop and smell the flowers…literally! We took our time to walk around the hallways of the school to truly get a sense of the environment and spirit of the school. We popped into several rooms that reflected the culture of the organization including the cafeteria, library, computer lab, book room, and faculty room. We also walked around the outside of the school to see the playground and front of the school. As we came to the main entrance of the school I walked forward to the front door while my advisor stopped in front a lilac bush to the right of the entrance. She stopped, gently took the flower in her hands and smelled the fresh, delicate scent that the flower was giving off. She didn’t realize it, but her small action of smelling the flowers was so powerful to me. She was appreciating the beauty in the small gift that nature provides us, which can be translated into larger lessons within the school organization on a daily basis with decisions that need to be made. 3. Appreciate the people in the organization – they will become your family. On a daily basis I have to say that I am truly impressed with the caliber of educators that I work with. The staff in my school keeps kids’ needs in mind at all times and they go above and beyond to deliver instructional plans to students. As my advisor and I visited the spaces in the school building she pointed out that small thoughtful gestures make a world of difference to the visitors in the school and the staff members. She often says that her school is like her family and I believe this statement to be so true. Small acts of kindness show people that they are cared for and this can make a world of difference for positive school culture. 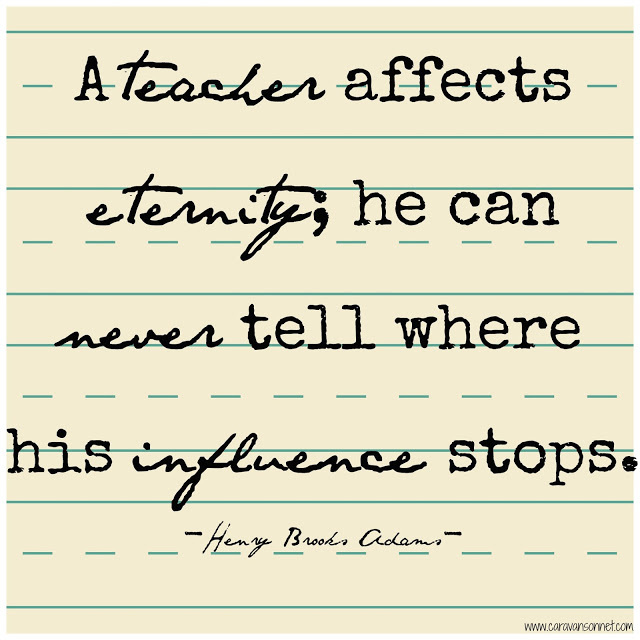 The quote above by Henry Adams “A teacher affects eternity; he can never tell where his influence stops” has always been a favorite quote of mine. I believe that all teachers significantly impact the lives of their students in meaningful ways. For me, my internship advisor has provided significant learning lessons for me, even beyond her awareness. This entry was posted in Leadership and tagged leadership, learning, lessons, principal by the5to9teacher. Bookmark the permalink.